A (now suspended) Twitter bot under the handle PZFeed Ebooks (@PZbooks) posted this tweet on November 11th, at 11:44 AM. Note the date carefully, that's November 11th, 2015. And yet, there are some news articles posted just today saying the exact same thing, with at least 120 dead, such as this article, this article, and many others. And yet, despite the shootings happening on November 13th, 2015, the Twitter post was made on November 11th, 2015. That's right, a full 2 days even before the shootings happened. If you click on the link to the tweet it's clear no part of the page has been modified, and the tweet itself has been replied to and retweeted countless times. 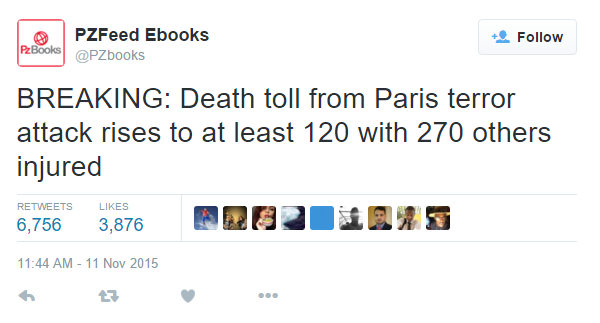 What could explain how it predicted the death toll from the Paris terror attacks a full 2 days before the shooting went down? it is a bot running on some kind of Markov chain, which will tell the software what kinds of words are followed by other kinds of words. These are commonly found on Twitter with the "ebooks" suffix in honour of an early notorious one: Horse_ebooks. There is freely available software for making such bots. The idea that it is a Markov chain bot is consistent with the other tweets from the account. 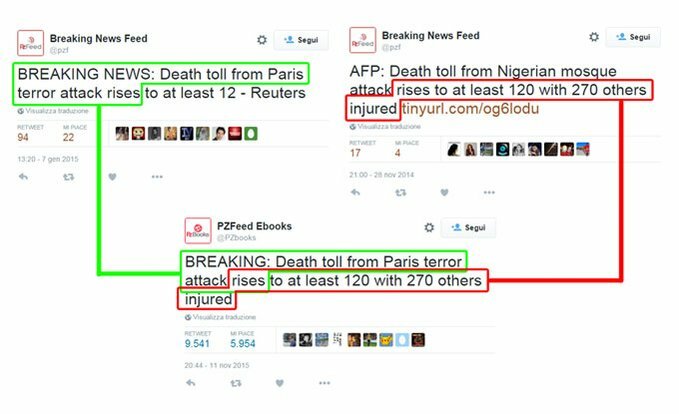 The bot's software knew that an incident like "Nigerian mosque attack" could be replaced with another incident like "Paris terror attack", which the PZFeed account had used to describe the Charlie Hebdo murders. That's all. The remainder of your question is whether this constitutes a "prediction". Human beings are pattern seekers and it's very easy to see some sort of mystery to this single tweet, but really, millions of silly things are posted to Twitter every day, and a robot-generated comedy account would seem to be about as far from willful prediction as it gets. Another "psychic Tweet" which comes to my mind is the young man who apparently saw Benedict resigning and Pope Francis getting elected in his sleep. This tweet is exciting because out of all of the predictions constantly posted to Twitter, it came true. But there is no way to measure how true a Twitter prediction is going to be until it actually happens. Popperian science can only maintain a cool skepticism about predictions with no reliable methodology behind them. Not the answer you're looking for? Browse other questions tagged terrorism social-media divination . Did the Zohar predict 9/11?